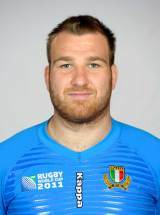 Prop Cittadini is a highly experienced prop and a well-known face on the Italian rugby scene. Having turned out 49 times for Calvisano, Cittadini can now be found at RaboDirect PRO12 side Treviso. Cittadini has four caps to his name and will be going to the 2011 World Cup as part of Italy's 30-man squad.